Fibrinogen Clauss (Fib Clauss) is the internationally most established method to determine fibrinogen in human plasma, which is of clinical importance when unexplained bleeding occurs. 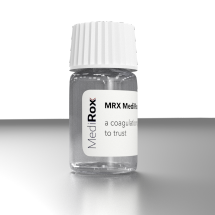 To fullfill the market requirements and needs MediRox has developed two different designs of Fib Clauss reagents, one having 100 UNIH/mL thrombin being highly resistent to dabigatran and one having 29 UNIH/mL thrombin suitable for the more price sensitive markets where negigible amount dabigatran is prescribed. 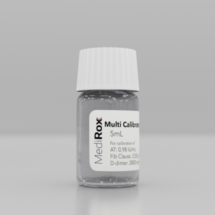 MRX Fib Clauss is a functional assay used for the quantitative measurement of fibrinogen in human citrated plasma according to the Clauss technique, where a high concentration of thrombin is added to diluted plasma and the clotting time is measured. The result is compared with a calibration curve using a reference plasma with known fibrinogen concentrations, and a result in g/L or mg/dL is obtained. Multi Calibrator I (AT, Fib, DD) intended for calibration of AT, Fib Clauss and D-Dimer assays. Multi Calibrator II (AT, Fib, PT) intended for calibration of AT, Fib Clauss and PT assays. PT is obtained as PT %.